Sport Climbing // Posts tagged as "Sport Climbing"
UPDATED 9/4/2018! The Happy Hour Wall is moderate sport climbing at its best. The wall is nestled a beautiful alpine setting on the northern end of Tensleep Bowl at Jackson Hole Mountain Resort. The crag gets morning sun and falls into the shade around 2:30 PM, making for a cool after work climbing destination. Sky Lounge is a classic new 5.11b sport route that charges up an independent path on the far left side of the Center Buttress at Rock Springs Buttress. The route's name-defining characteristic is a huge 2nd pitch belay ledge equipped with a built-in granite belay chair. Get the beta, download a free guide, then go climb! Download a free climbing guide to Lizard Rocks – an easy-to-moderate sport and trad climbing crag near Pinedale, WY. The drive to Lizard Rocks is quick and the approach hike is short and painless. 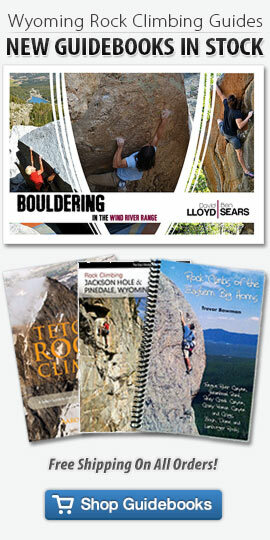 For the most part, the routes are safe and well suited for the beginner to moderate climber. Several of the climbs are family friendly. Boulder Lake Domes – New Routing Anyone? Free downloadable mini-guide, photos, and map to Boulder Lake Domes. Above Boulder, WY’s, Boulder Lake Trailhead and summer homes, near the edge of the Wilderness Boundary, is a cluster of large granite domes. Although these rock formations have always had obvious climbing potential, they've manage to remain relatively unexplored until 2010. There's still a lot left to be explored but here's some beta to get you started. I don't count my sit-ups; I only start counting when it starts hurting because they’re the only ones that count.